In a post I did a few months back about creating a flawless base when you have acne scars, I mentioned that my absolute favourite primer for doing this was Smashbox’s Photo finish Primer. I still stand by that however sometimes I don’t always want to wear something so heavy on my skin. I decided to go in search for something a little more natural rather than silicone based. After perusing the Boots aisle for what seemed like an eternity (nothing new there), I struck gold! 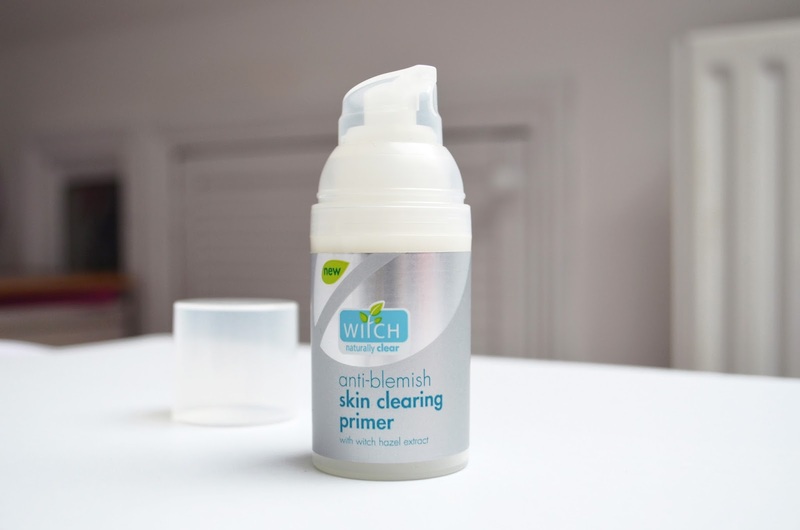 I came across the Anti-Blemish Skin Clearing Primer by Witch. The brand aims to be a natural remedy for blemishes using the anti bacterial ingredient witch hazel as the basis of all of their products. My main concern with using a silicon based primer is that using it often means my giant ‘orange peel’ pores get clogged up and blocked causing more spots. Surely using a primer that would help combat the spots under my makeup is the genius beauty fix I’ve been waiting for? The packaging is pretty without being too fancy or clinical; nor is the bottle too heavy to carry around should you take your makeup with you everywhere you go. I’m not always a fan of products that come with a pump because it allows for lack of control on how much product you want to use. Luckily this bottle is made well and you can control just how much product you need. 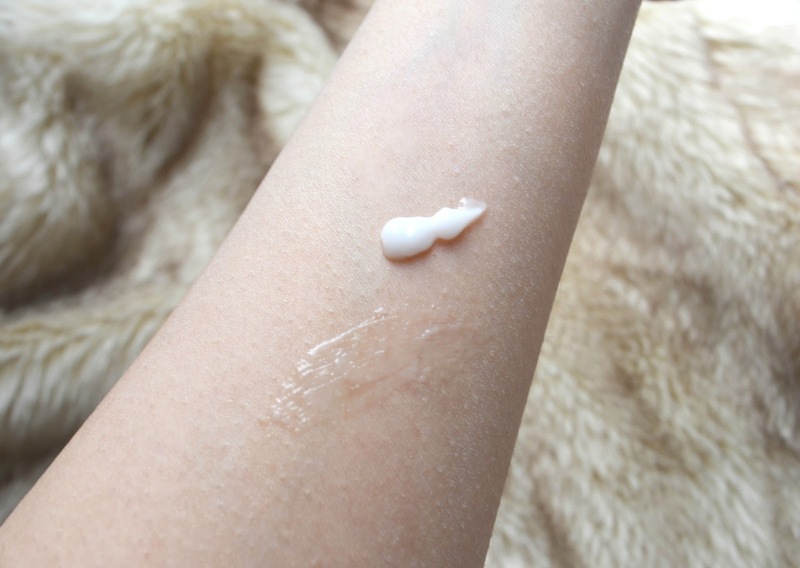 Always a bit reluctant to photograph a squirt of white stuff on my arm (for obvious immature reasons) but for products like this it’s often great to know how it transforms from bottle to contact with the skin. As you can see from the photo below, It comes out as a white opaque creamy substance. Not too thick and not too watery, just thick enough to be able to work into your skin. Once you start spreading it on your face it transforms into an transparent substance. I found that it spread well and dried really quickly. There was no greasy or sticky feeling but what I love most is that once it’s on your face, you can feel this amazing tingling, cooling sensation. I love products like this because it makes me feel as though it’s actually doing something! Like all products that contain witch hazel, the product has a slight medicinal smell. Luckily it’s not too strong and once you’ve applied it to the face, so it wears off fairly quickly. After a good three weeks of use I’ll be honest and say I’m not sure how well it works with fighting spots. I haven’t had very many recently *touching all the wood I can find! * however it might be that the primer has helped keep them at bay? I’m going to be optimistic and say this is the case. Plus, my pores which usually get clogged with primers (particularly around my nose) didn’t get clogged at all. I was really impressed by this alone. Overall, I really loved using this product. I’m not sure how well it works for keeping my makeup in place, but I like the idea that it creates a shield between my makeup and my skin. t’s definitely one that I’ll be using more on a regular basis and I’ll save the silicon based primers for special occasions.